The steady stream of new projects proposed for or underway in the Valley’s Warner Center neighborhood continues, and we’re getting a closer look at two projects that will bring almost 600 apartments total to the neighborhood. The two new complexes, called Q East and Q West, will be developed by California Home Builders and designed by architecture firm Newman Garrison + Partners, a representative for the architects told Curbed. The Q East development would rise at Erwin Street and Variel Avenue, while Q West would be across from Westfield Topanga mall, facing Topanga Canyon Boulevard. 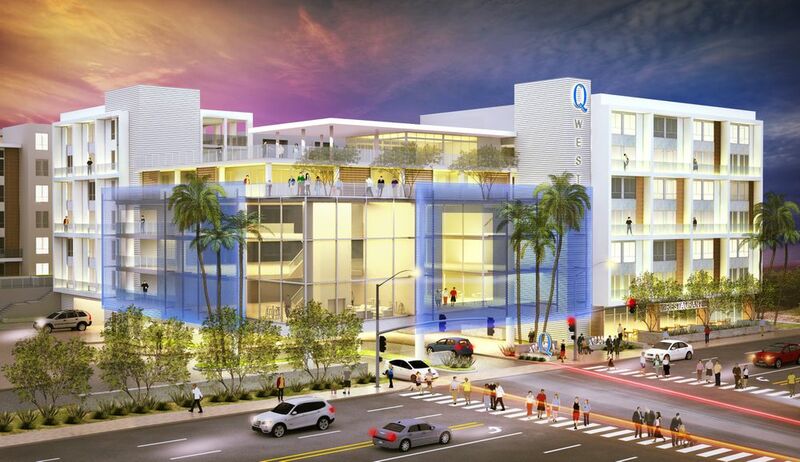 The seven-story Q East would have 241 apartments and approximately 46,000 square feet of retail and commercial space on its ground floor, along with restaurants and a number of live/work lofts. Q West would hold 347 apartments and just under 20,000 square feet of commercial and residential space along the street. Both complexes are geared toward attracting the desirable “young professionals and millennials” market. Each apartment building will feature resident amenities including a rooftop deck, a pool, and outdoor lounges with fireplaces and TVs. Q East is already under construction, with an expected opening in 2019. The site for Q West has been razed, and construction is expected to begin before the end of the year. Both complexes were designed with the Warner Center Specific Plan in mind. The plan lays out guidelines for development in the community through 2035 and aims to create a walkable, transportation-friendly, and generally more hip neighborhood. The Q East pool deck.